Guest post ? no. Guest blogger? no. But this cake wasn’t exactly made by me. My friend wanted to make a cake and she came along and I helped her with it.. She wanted to make a Black Forest so, on with it! yay! So first thing we did was to mix the Chocolate sponge and then with the cherry filling. Black Cherries straight out from the can. I reserved 1/4 cup of syrup and added with 2 tbsp of corn flour, mix well. 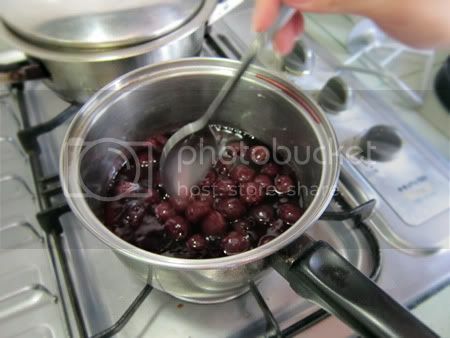 Then in a saucepan, pour in the rest and about 1/4 cup caster sugar to sweetened it. Bring to a boil, then reduce heat and add the corn flour mixture. Stir till the corn flour acts and turns the mixture to something quite starchy. Add a cap-ful of kirsch / rum to the cherries. Cover and keep in the fridge to cool. Then because it was my friend’s first time baking and we didn’t have much time, we settled with using sponge mix. Sometimes cake mixes can save alot of peoples life so don’t discriminate lol. We used 250g of Chocolate Sponge Cake mix cause we only wanted to make 1 cake. In a mixing bowl, whisk 5 eggs till slightly frothy. Add in the sponge mix and whisk till it’s thick and creamy and when you lift the whisk up, the batter drops like a ribbon. Then add about 2 tbsp of water and whisk on a low speed. Add about 50ml oil at the end. The trick is after you add the oil or melted butter to sponge batter, don’t overmix it as oil will depress the air bubbles from the eggs. So into the pan and in a 200 C oven for about 20 minutes. 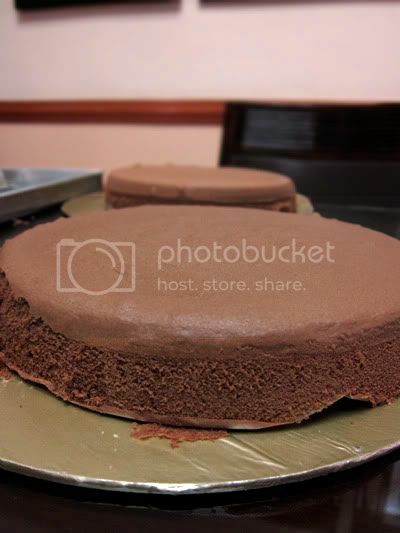 We baked in 2 pans cause it saves more time and we don’t have to torte the cake!! I would have baked in 3 pans if I had 2 inches high pans. Then to assemble it’s pretty easy. 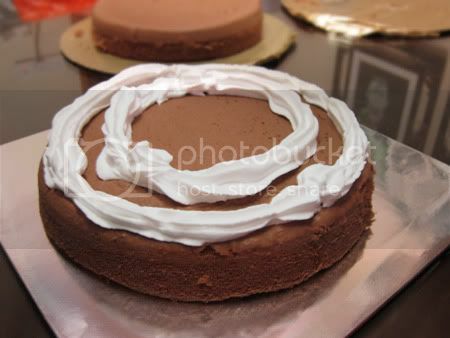 If you prefer thinner layer of cakes, torte in half but my friend didn’t want to, so we’ll just leave as it is. 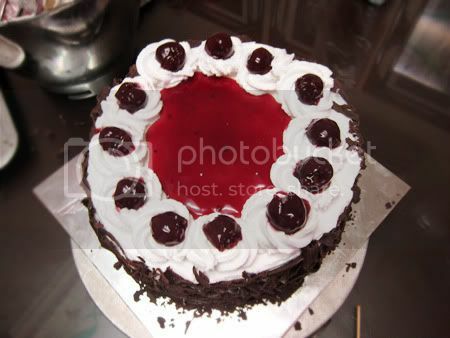 Then, whip some cream (about 250ml non-dairy whipping cream / 400g dairy whipping cream) Pipe circles like this on 1 of the cake and arrange the cherries in between the piped cream. We don’t like skimpy portions lol. We used almost all the cherries from the can, left about 12 cherries to decorate. We don’t like super pink-highlighted-preserved cherries either. 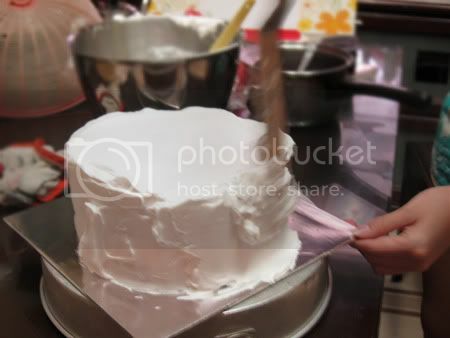 Then stack the other layer of cake on top, and frost the side of the cake! I don’t know if you believe, but I actually don’t have a turn table at home. I frost all my cake without a turntable, and it never came across my mind that a turntable is a must. But sometimes I would need it when the cake is humongous! 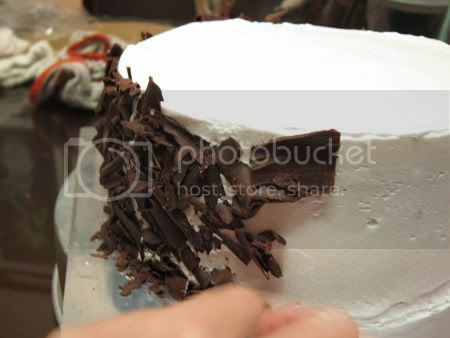 And to decorate, carve some chocolate shavings. To do so, get a chocolate block, use a peeler and start peeling the block! Best to do so if your place it’s not too hot otherwise the chocolate melts very fast! Then decorate as you wish ! 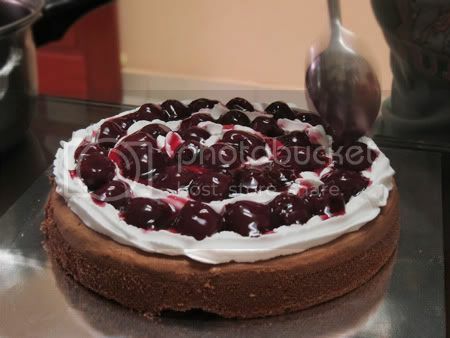 My friend piped some rosettes on top and added the cherries to decorate. 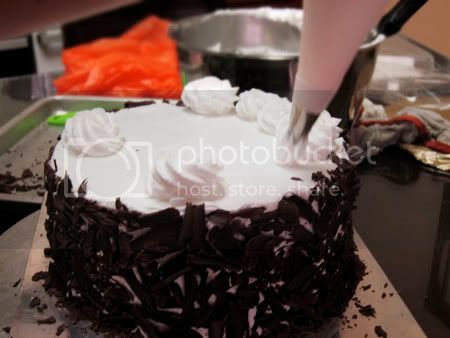 Thanks for sharing, next time I want to make a black forest cake too. Well done to you and your friend. You are blessed to be able to make cakes just like that! Trissa, Haha sometimes we just have to keep it simple and don't over think. Oh, my! 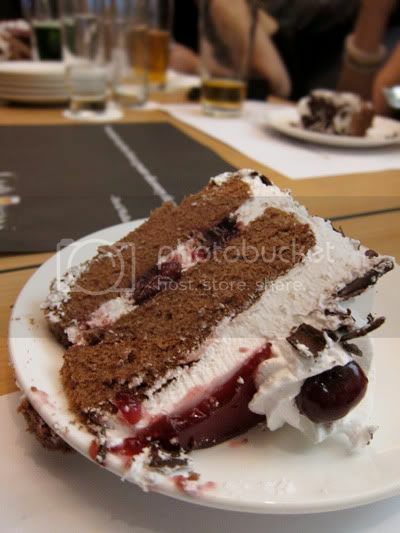 Black Forest Cake! Yea … Nothing beats home-made goodness! !